Photo taken by Sarah Kelliher for Knight Sports Now. A 24-game winning streak and a second consecutive AAC Championship are at stake for No. 8 UCF on Saturday when it hosts Memphis at Spectrum Stadium. The Knights (11-0, 8-0 AAC) are facing the Tigers (8-4, 5-3 AAC) for the fourth time in the last 14 months, having won the previous three meetings. This time around, there will be a significant difference in the matchup as UCF will be without junior quarterback McKenzie Milton after he suffered a season-ending leg injury in last week’s win over South Florida. With that on top of the magnitude of the game itself, Saturday afternoon promises to be an emotional one. With Milton sidelined, the Knights offense will now be led by redshirt freshman Darriel Mack Jr. The quarterback change comes at a tough time for UCF, especially considering the disparity in experience between the two quarterbacks. Despite the transition, Heupel said there aren’t too many adjustments that need to be made with the offense. Mack started in the Knights’ 37-10 road win over East Carolina on Oct. 20 and led a strong offensive performance in relief last week against South Florida. On the season, he has completed 21 of his 43 passes for 174 yards in addition to running for 281 yards and two touchdowns on 40 carries. Mack should benefit from having one of the most productive backfields in the nation. UCF ranks sixth in the country with 269.8 rushing yards per game. Most recently, that effort has been led by sophomore Greg McCrae. The former walk-on ran for 181 yards and three touchdowns in last week’s win, bringing his season numbers to 895 yards and eight scores. With 105 yards on Saturday, he would become the first UCF player to rush for 1,000 yards in a season since Storm Johnson did it in 2013. On the other side of the field from the Knights is a team that took a different path to Saturday’s game, needing to overcome a 1-3 start in conference play to win its division. The Tigers have won four straight games, with much of their success led by junior running back Darrell Henderson. His 1,699 rushing yards this season is the second-most in the nation. Memphis has seen some inconsistency at quarterback throughout the year, with redshirt junior Brady White needing to settle in during his first season as the starter. His production has picked up a bit as of late, but he has thrown two interceptions in each of his last two games. Henderson and White are at the forefront of a Memphis offense that is sixth in the country in scoring offense, averaging 43.8 points per game. While the UCF defense did shut out the Tigers in the second half of their last meeting, senior defensive end Titus Davis knows that his group has found ways to improve since then. UCF and Memphis last met on Oct. 13, with the Knights overcoming a 30-17 halftime deficit to win 31-30 on the road. It was their 12th straight victory over the Tigers, though the last two meetings have been decided by a combined eight points. Saturday’s matchup is a chance at redemption for Memphis, Norvell said nothing from the past is influencing his team. 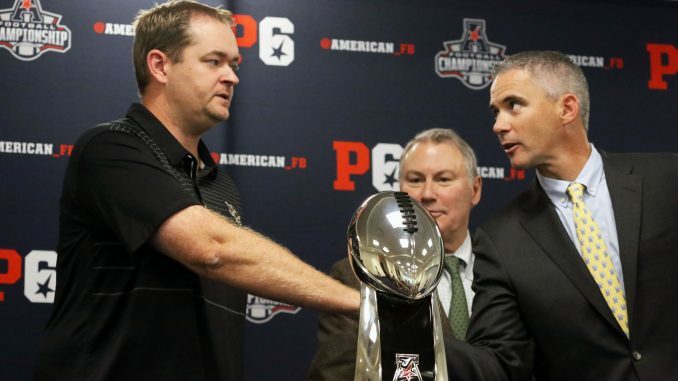 A victory for UCF would lead to a berth in a New Year’s Six Bowl for the second straight year. After winning the conference title in 2017, the Knights took down No. 7 Auburn in the Peach Bowl on New Year’s Day to complete a perfect season. Saturday’s game will kick off at 3:30 p.m.